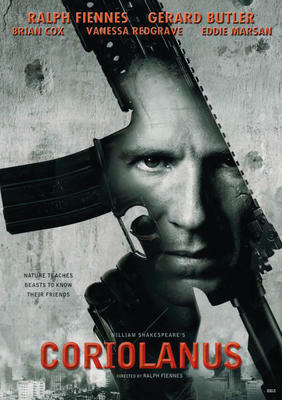 Ralph Fiennes makes his debut as a director and stars in “Coriolanus”, adapted from the Shakespeare tragedy. Fiennes plays Roman general Caius Martius. We meet him as he quells grain riots at home and leads a siege and assault abroad, against Rome’s Volscian enemies on a Balkans-like urban battlefield. Martius is soaked in the blood of his enemies and seems at the height of his powers, pushing himself and exhorting his men. He clashes in single combat with Aufidius (Gerard Butler), the Volscian commander and Martius’ mortal enemy, until they are dragged apart. Everything we see shows Martius as tireless and relentless. What is driving him? At home he is received as a hero and honored with a new name of Coriolanus. The home front wants a piece of him. First, his mother Volumnia (Vanessa Redgrave) and politician Menenius (Bryan Cox) maneuver to have him elected consul. He reluctantly agrees. He is approved by the Senate, but a popular riot is instigated by a rival faction. Martius is humble under praise, but explosively defensive under criticism – Fiennes’ proud anger is something to behold. Martius is provoked to fury at the mob, and ultimately exiled. He journeys to his rival Aufidius, and offers his life or his services against Rome. In every case when someone tries to use Martius for their own ends, trouble follows. The efforts to use Martius as a political figurehead, the successful conspiracy to oust him, and Aufidius’ decision to retain him all bring mess that compounds towards tragedy. It seems most remarkable that Aufidius, who perhaps would know Martius’ motivation better than most, would agree to fight alongside him. Butler doesn’t have a huge amount to do in the film, but he sells well Aufidius’ dilemma, weighing whether he can get the better of Martius, using him while plotting his subsequent demise. By now it is clear that Martius cannot be changed, so either he must succeed in his revenge or be stopped. Redgrave displays Volumnia, sent with Martius’ wife and son to try to stop him, beseeching in physical and emotional waves. Redgrave and Fiennes are captivating. Where Martius at war circled and parried when fighting Aufidius in battle, now he is pinned to his chair by Volumnia, bearing her relentlessness that seems so much like his own. Despite the crackling dialogue in this confrontation and throughout the film, I found the most satisfying scenes those where we observed Martius alone: sweeping through a shell of a building in the opening combat, and hiking into exile away from Rome and to Aufidius. It is never quite explained why he is blamed for the grain riots that open the film, but he is unwavering in his self-belief, so we are forced, like the people, to take him or leave him without debate. His world is black and white, with only one correct, honorable path. When we see Martius with others they fill the scene with words, talking to, at or about him. Their words are bound to provoke him. Alone nothing disturbs him from within: he simply moves forward.